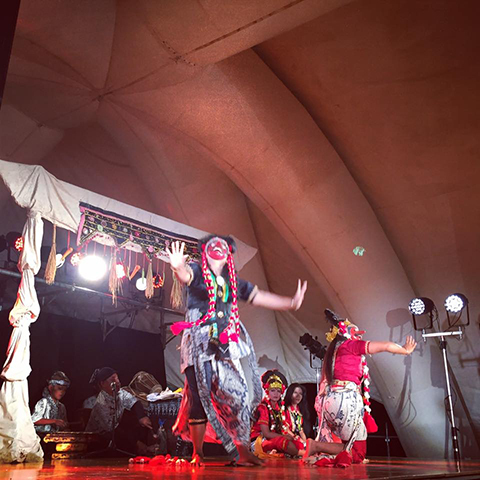 Initiated in 2014, the annual Sanriku International Arts Festival aims at contribution to restoration of the Sanriku region after its devastation by the earthquake and tsunami in 2011, specifically though empowerment of traditional folk performing arts in the region. 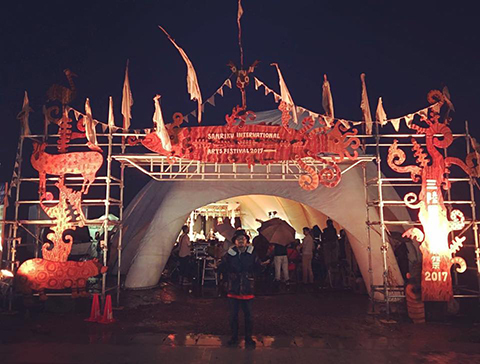 Inviting guests from different parts of Asia for a variety of exchange programs, the Festival’s emphasis falls on the function of communal practice of folk performing arts in the society. 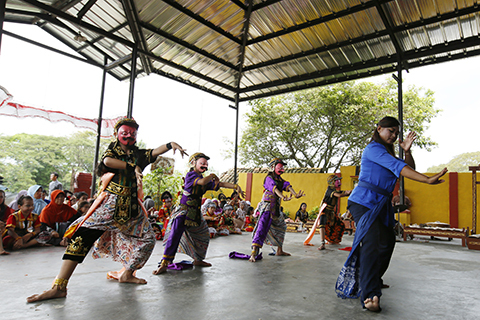 Our international guests of this year’s edition were a mask dancer Aerli Rasinah and her troupe from Indramayu, West Java, Indonesia and the traditional dance and music ensemble of Bajau in Semporna, Sabah, Malaysia. 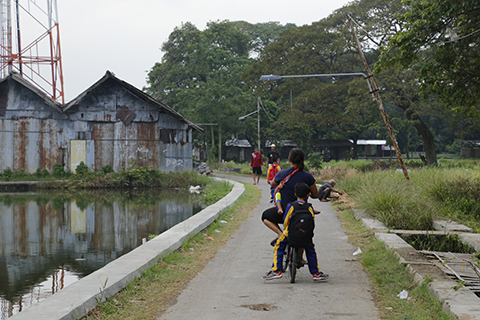 Indramayu is a pastoral village located on the north coast of West Java. 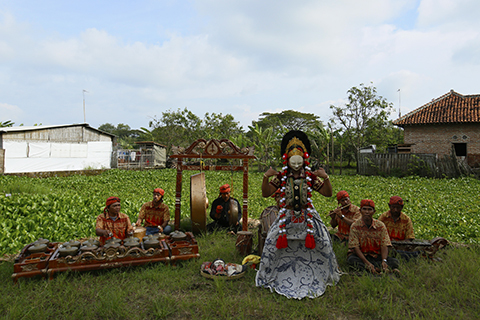 The origin of the mask dance allegedly traces back to the 16th century, when one of Islamic saints in Cirebon created it for propagation. Since then it has generated multiple local schools in the region. Putting masks of various characters from Panji’s tale, the dancer attracts the audience with her/his skill and playfulness of impersonating noble Panji, his brutal rival Kelana, or sophisticated dandy Pamindo, among others. Aerli Rasinah is the granddaughter of Mimi Rasinah, the highly acclaimed mask dance master who has passed away in 2010. Mimi, after her 20 year suspension of career until the mid-1990s, was suddenly “discovered” by musicologists. They encouraged and persuaded her to return to stage, and it eventually led her to a fame immediately after her first international tour in Japan, 1999. In this period, Aerli received special attention and training from her, and now teaches over 500 students inheriting the great legacy. Sanriku International Arts Festival 2017 invited not only Aerli and her troupe but also one of her teenage students to show how the local culture is succeeded generation by generation. This year’s festival was divided into two parts; August 11 and 12 in Ofunato-city, Iwate, and August 19 in Hachinohe-city, Aomori. 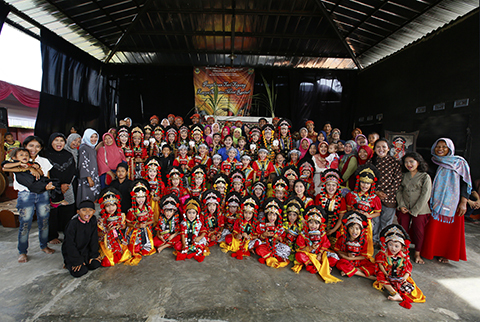 Though haunted by rainy weather, numerous audience welcomed and enjoyed a wide array of folk performing arts in Sanriku such as Kagura, Kembai or Shishi-odori, together with mask dance from Indramayu, dance and music of Bajau, joined by performances by contemporary dance artists, community dance performance shared with local citizen participants, and local street dance group, among others.